We are happy to announce version 1 of our new Faculty Listing tool. This tool will allow Academic Departments to display a listing of faculty members on their websites; this listing is synced with our main University Faculty Profiles, so there is no need to keep multiple sources of content updated – this is a “set it and forget it”! To use the Faculty Listing tool, send a message to the Web Services team, and we will activate it on your site. Once the listing tool is activated on your site, creating a faculty listing is simple. Add a new page and give it a title (“Our Faculty” or simply “Faculty” is appropriate). 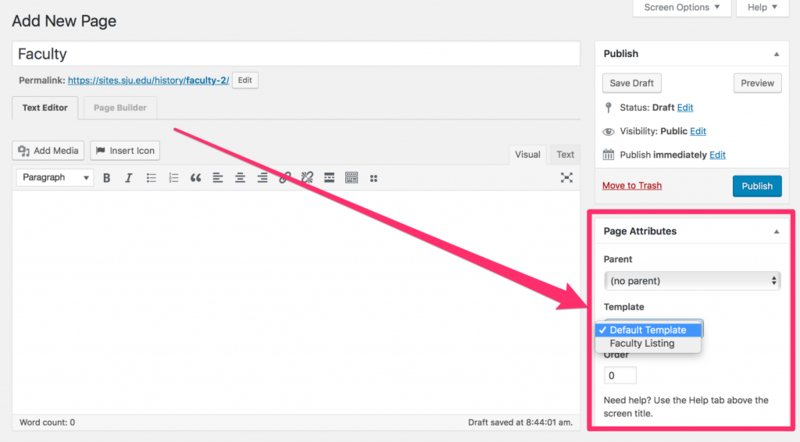 Over in the right sidebar, under the “Publish” section, there will be a special area with “Page Attributes“. In this area, change the Page Template to Faculty Listing. 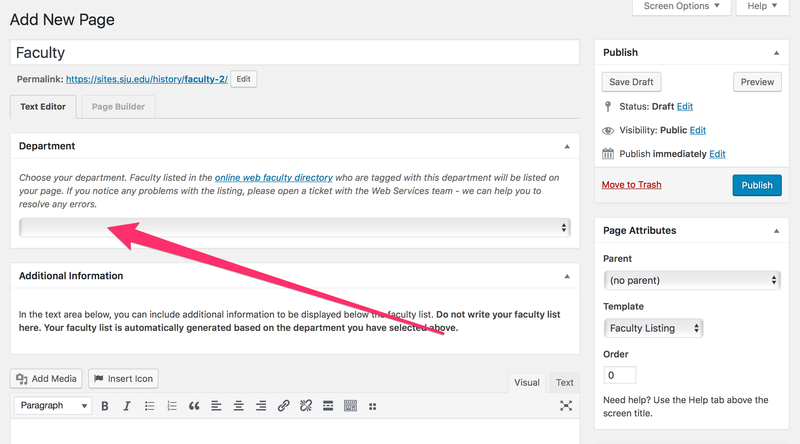 Once you have selected the Faculty Listing template, new fields will appear above where you normally create your page content. You can use the select box to choose your department; if you have additional information you wish to display below the listing of faculty, you can include that in the text box below. If you notice that there are any errors with the listing of faculty, please contact Web Services. Faculty can make changes to their profiles and the changes should appear on your listing automatically. The accordion module allows you to create simple container rows for displaying labels and hidden content. Users click on the container labels to display further information held in the accordion content area. Accordions are great for FAQs where a simple list of questions can be clicked to open up answers. The accordion module is part of the Page Builder, and can be accessed under the Advanced Modules area. Check out the video below for a great introduction to the Accordion Module. Video produced by the Beaver Builder Team.